We have already seen a few heroines like Manisha Koirala, Mamta Mohan Das and Sonali Bendre who defeated cancer and have been helping others who are going through the same. 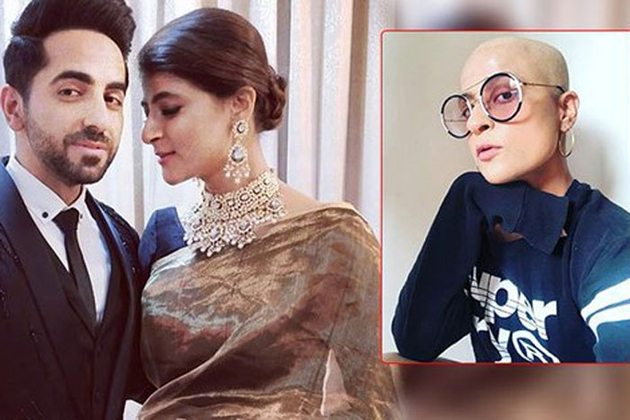 It is known that one of the talented actors in Bollywood, Ayushman Khurrana's wife Tahira Kashyap was diagnosed with breast cancer recently. When asked Ayushmann Khurrana about this in an interview, he said that she is very strong and is battling cancer well. Tahira is also proving the same by fighting cancer out. When she was going through the rough patch of her life with chemotherapy, she didn't opt for wigs and hair extensions and decided to go bald. "Hello world! That's a new me with the old self! Was getting tired of the extensions. Well, this is how it is & it's so liberating, so much so that I don't have to duck the shower while bathing or while picking up the soap! Never thought I had go bald, but this feels good" captioned Tahira posting a bald picture of her on social media. The fans are lauding for her decision. Not only the netizens but also the film celebrities are appreciating the new look of Tahira. Even Ayushmann also couldn't stop himself to admire her. He commented that she is a 'hottie'.